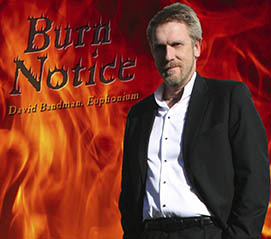 One of the finest, but least hyped euphonium players in the country, David Bandman has released Burn Notice. Not only does he play impossible euphonium lines, but he also found time to deliver excellent performances with: trombone, guitar, bass, keyboard sequencing, and he also did all the writing of compositions, all the arranging, recording and editing; if that’s not musical multi-tasking, nothing is. Burn Notice contains ten consistently engaging tracks. Bandman’s euphonium playing is simply amazing, as demonstrated by his wide warm tone, pillow-to-billowy range and no-nonsense approach to all musical situations; those same attributes are also ever-present in both his improvisations and his writing. Bandman is, essentially, the man upfront on the album. Every track, from the bluesy “Burn Notice” to the rockin’ “Huggin’ the Right,” to the simply funky “Wicked Snooze,” serves as a showcase for his horn. Bandman’s use of ink for putting this project together is noteworthy, his writing is creative and allows his euphonium skills to make important contributions to each track. On “Burn Notice” the written call and response pattern of the melody contributes to allowing the listener to hear his sterling skills on the euphonium. Bandman’s tutti writing is virtuosic and exciting. His use of form also helps build excitement and keep things moving and sounding fresh. His solo stands tall on the track, rock solid from top to bottom, and his mastery of time and intonation serves as the driving force behind his strong solo style. On the brilliant “Shankopotomus” Bandman shows he is comfortable on the skyward reaching melody, creating another dimension here, helping to bring variety to the table. Speaking of variety, the time signature changes on this track are a nice touch. Burn Notice manages to live up to its titular mission while highlighting an incredible euphonium master and his ace writing. Be the first to comment on "David Bandman | Burn Notice"